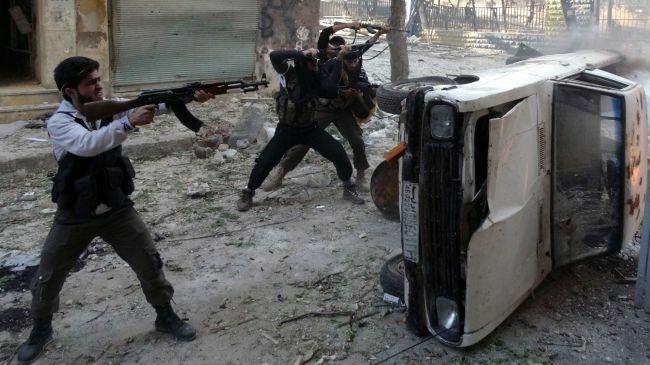 JNN 14 Jan 2014 Damascus : The Islamist State of Iraq and the Levant has killed Hundreds of rival Wahabi rebels in Syria over the last couple of days as the Al-Qaeda-linked group regained most of the territory it lost in the northeastern Raqqa province, according to activists. The group added that 157 individuals were from the ISIL, 240 others were from more moderate factions and 85 were civilians. According to opposition sources, Nusra Front’s commander for Raqqa province Abu Saad al-Hadram was among the militants killed over the weekend. “The rebels lack the organization and the firepower to win. It will be difficult to defeat ISIL without military strikes from someone like Turkey,” Farraj said. “Many did not see a point in fighting their own relatives. ISIL is now in control of 95 percent of Raqqa and its rural environs. Tel Abyad is also back with it,” he said. An ISIL statement called on Raqqa tribes to pull out their members from anti-ISIL militant units and said the attacks against the group were designed to “destroy the nucleus of the caliphate” and promote a “heathen” alternative. ISIL pulled out of Raqqa and other towns in northern Syria this month after an extremist militant alliance attacked its strongholds, taking advantage of growing popular resentment of the group’s commanders, their killing of other militants and a drive to impose a strict interpretation of their law. But ISIL has regrouped in the last few days, using snipers, truck-mounted commando units and suicide bombers. Opposition sources said the expertise of its foreign commanders, including a senior figure known as Omar al-Shishani, had been crucial to its advance. In the province of Aleppo west of Raqqa, activists said ISIL had regained several rural towns, including Hreitan and Basraton, where ISIL killed a senior commander in the Nour al-Din Zanki brigades, a key unit in the newly-formed Mujahideen Army, which has been fighting ISIL in Aleppo. Some experts point to a change in the discourse as extremist groups take hold of Syria. Political analyst Sharmine Narwani told that many key players are starting to view Syrian President Bashar Assad as a lesser evil. This entry was posted in Middle East and tagged Ahrar al-Sham, Islamic State of Iraq, Nusra Front, Syria, syrian president bashar assad. Bookmark the permalink. ALHAMDOLILLAH, BUT ONLY 700 YAHOODI-WAHABIES SENT TO JAHANNUM / IF THERE WERE ANOTHER 2-3 ZEROES ADDED TO THE FIGURE , IT WOULD HAVE BEEN KHAS KAM , JAHAAN PAAK . WILL YOU PLEASE , NEXT GIVE SUCH NEWS , BUT PLEASE , DON’T DELAY , WAIT IS GREAT PAIN ..